A cold war drama inspired by true events, Bridge Of Spies succeeds in recreating an era of secrets, spies, and suspicions. The story of an insurance lawyer embroiled in a high stakes prisoner exchange is compelling, but falls just short of stirring the spirit. New York, 1957. 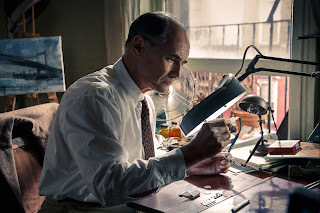 Soviet spy Rudolf Abel (Mark Rylance) is arrested by a team of FBI agents. With the US government eager to demonstrate due process, slick insurance lawyer James Donovan (Tom Hanks) is nominated to defend Abel. Initially hesitant, Donovan soon jumps into the challenge. Abel's fatalistic, calm demeanour impresses Donovan, and the two men establish a rapport and mutual respect, with Donovan understanding that Abel is simply doing his job to the best of his abilities. But Donovan's enthusiastic embrace of his role as the representative of the most hated man in the country takes a toll on his wife Mary (Amy Ryan) and family. Meanwhile, the US ramps up a spy flight program designed to capture photos of Soviet military installations from enormous altitudes. But pilot Francis Gary Powers (Austin Stowell) is shot down and captured by the Soviets. The CIA approach Donovan to broker a prisoner exchange deal to trade Abel for Powers, and he is thrust into the dangerous world of Berlin being actively bisected by a wall. Young American student Frederic Pryor (Will Rogers) is caught up in the chaos and held by the East Germans. Donovan has to deal with Soviet and East German secret services at odds with each other, and try to negotiate a risky deal within a spy environment he knows little about. 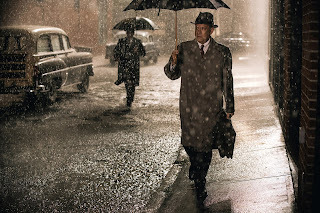 Directed by Steven Spielberg and co-written by the Coen brothers with Matt Charman, Bridge Of Spies oozes with quality. The set designs from the late 1950s and early 1960s evoke the Cold War era at its most paranoid, with agents on both sides of the curtain weighing every move and every mistake against a shortening distance between finger and button. The scenes in Berlin are particularly effective, capturing a city at the literal fault line of east and west, a wall actively being built to harden attitudes and close hearts. Spielberg throws in the occasional mild scene of action to inject some energy into the proceedings, but this is primarily a character study focusing on the relationship between the lawyer Donovan and the spy Abel. The film is at its best when the two men are sharing scenes, with the sharp Donovan applying all his inquisitive skills to get to know his client, and Abel giving nothing away with the most docile possible disposition. It's not that Abel does not care; he just realizes that at the end of the day he is a a very small pawn in a much larger game, and his fate is formally in the hands of nations. At just over 140 minutes, Spielberg adopts a languid pace, and Bridge Of Spies could have easily been tightened by about 20 minutes. Several scenes go on longer than they need to, with the Francis Gary Powers sub-plot unfolding mechanically and with no character depth. Powers' CGI-enhanced fall from the sky is particularly overblown in the context of a cerebral cold war drama. In contrast, the story of student Frederic Pryor receives short thrift, as he is introduced late in the story and almost as an afterthought. Tom Hanks delivers a reliable but not particularly memorable performance. Mark Rylance emerges as the subdued star of the film, with a grey performance filled with the contradictions and vagaries that define the life of a spy. Amy Ryan is mostly wasted as the worried wife, while a haggard-looking Alan Alda gets a couple of scenes as Donovan's boss. Spielberg finds a brilliant climax at the snow covered Glienicke Bridge, a simple exchange transformed into the essence of a complex conflict between giant foes who pointed angry words, harsh lights and large guns at each other, but never quite pulled the trigger. 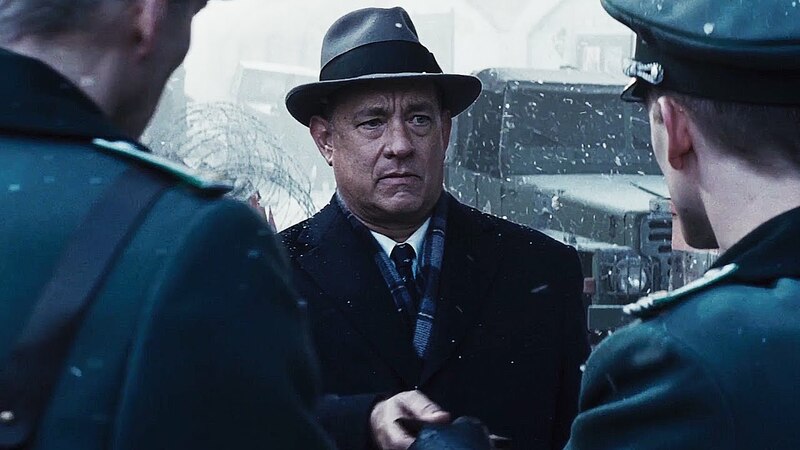 The Cold War in a perfect tableaux, Bridge Of Spies is the beautiful image of a most dangerous time.